Following on from my Pesto post a few days ago (check previous post for recipe), here is a super speedy dinner option. I always like to keep a jar of pesto in my fridge or freezer, so that I can jazz up a plain piece of fish in no time. 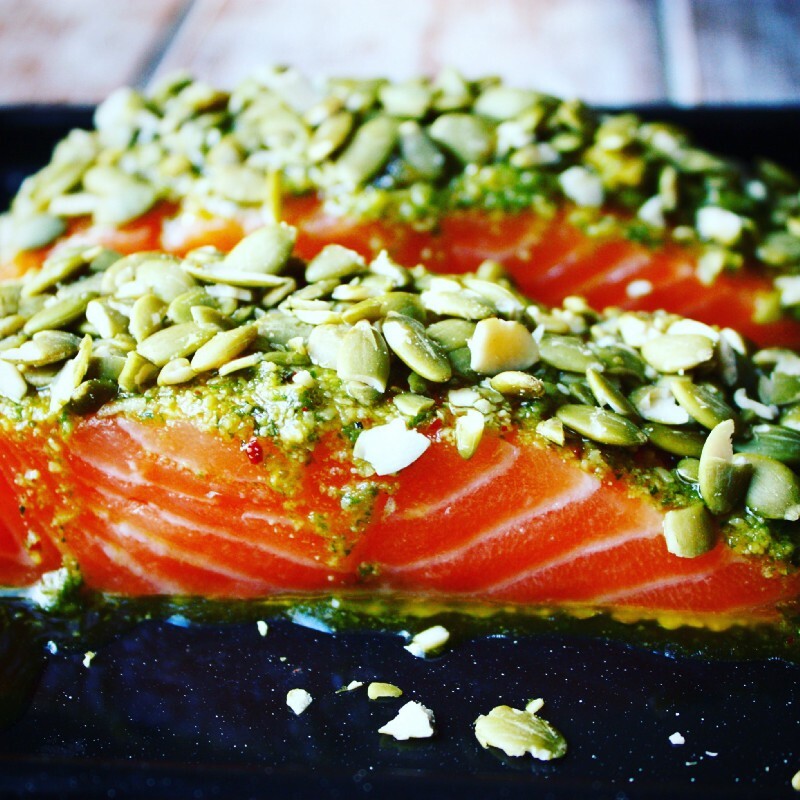 Simply smother the fillets in 1/2 a tablespoon of pesto, sprinkle with pumpkin seeds and bake in the oven at 180 degrees for 12–15 minutes; and Hey P(r)esto — dinner done! Salmon is an excellent source of good quality protein and is very nutritionally dense, rich in vitamins and minerals. It is high in anti-inflammatory and immune-boosting Essential Omega 3 fats. These fats help keep our brains, heart and joints healthy. We should aim to include oily fish into our diet at least twice a week, and when it’s as easy as this, there’s no excuses! Cheats tip: If you don’t have time to make fresh pesto — a shop bought jar still does the trick!